Via iChat, you and your buddy from afar can collaborate on a Web site or some other project. If you both have Macs with Leopard, you can work on one or the other’s screen remotely — just click back and forth to swap screens. Sharing a Mac screen works through any of the accounts that iChat makes nice with: MobileMe, AIM, Jabber, or Google Talk. From the Buddies menu, choose either Share My Screen or Ask to Share. (Rest assured you can politely decline if you’re the one being asked.) If you both agree, you can each work on the shared desktop, even copying files by dragging them from one desktop to the other. iChat keeps an audio chat going so that you can let each other know what you’re up to. 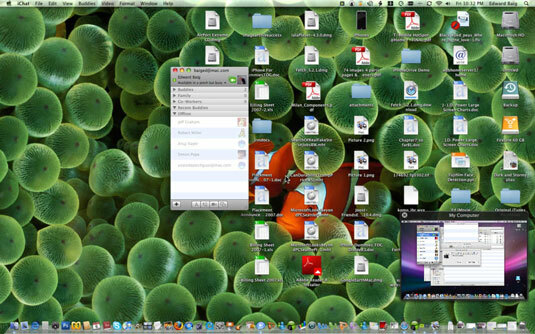 If you’re sharing the other person’s screen, you’ll notice your own Mac desktop in a tiny window. Not satisfied with what your chat buddy is telling you? Press Ctrl+Escape to put an instant end to the screen sharing session. As you might imagine, this screen sharing business can get a little too close to home, especially if you don’t fully trust the person you’re letting loose on your computer. Be especially leery if someone not on your buddy list comes calling with a screen sharing request. You should also be careful before granting permission to someone on your Bonjour list. They are not always who they say they are.